NORTHRIDGE, CA—Maryland Sound (MSI) deployed an extensive JBL VERTEC line array system for the recent “Rally to Restore Sanity and/or Fear.” Cohosted by Jon Stewart of Comedy Central’s The Daily Show and Stephen Colbert of The Colbert Report, the Rally to Restore Sanity and/or Fear took place at the National Mall in Washington D.C. Designed as a satirical comedic response to prior rallies that have been built around some of the political spectrum’s more extreme causes, the rally’s stated purpose was to provide a voice to the “reasonable majority” of U.S. citizens who are often not accurately represented in the media or in politics. The turnout was overwhelming, with CBS News estimating an attendance of 215,000 people for the 3-hour event. Maryland Sound recently provided JBL loudspeakers at the Comedy Central “Rally to Restore Sanity and/or Fear” at the National Mall in Washington, DC. In addition to a variety of comedy segments involving Stewart, Colbert, and The Daily Show correspondents, the Rally featured musical performances by Jeff Tweedy and Mavis Staples, John Legend, Yusuf Islam (formerly Cat Stevens), the O’Jays, Ozzy Osbourne, Kid Rock, and Sheryl Crow. Vocal group 4TROOPS performed “The Star- Spangled Banner” in the first hour of the rally, while Tony Bennett sang “America the Beautiful” to close the event. The Roots served as the rally’s house band, opening the rally with a 30-minute set and supporting all other artists throughout the event. The rally also featured appearances by Adam Savage and Jamie Hyneman of television’s MythBusters, Don Novello’s Father Guido Sarducci character of Saturday Night Live fame, and Kareem Abdul-Jabbar. 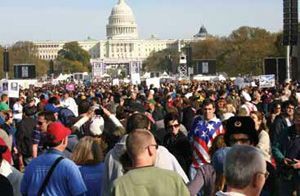 Maryland Sound was responsible for sound reinforcement at the Rally to Restore Sanity and/or Fear, with the main left-right line array system consisting of VERTEC VT4889 full-size line array loudspeakers and VT4880A fullsize arrayable subwoofers. To reach the massive audience, Maryland Sound also provided 12 delay towers throughout the Mall, which consisted of VT4889 loudspeakers, VT4888 midsize line array loudspeakers, and VT4880A subwoofers. Crown I-Tech HD amplifiers powered the entire system. Harman’s HiQnet System Architect system software was used for configuration, remote control, and monitoring of the system.